So, I had my four month followup with my surgeon yesterday. I was pretty worried that things had blown up… as I said, I have been struggling here of late and I feel myself backsliding to my old eating habits. Imagine my surprise when Dr. McPhee used the word “remission”. Then it sank in and I was overcome with this sense of relief. I have achieved my primary goal of having bariatric surgery. It kind of makes all I went through in the program worthwhile. All the tears I shed, the pounds I shed and regained and shed again. The physical pain of the surgery itself. The digestive issues post-surgery. If I had to do it again, no question. It was all worth it to hear those words. I would be horribly remiss, however, if I didn’t thank you all for your support. Yes, you, my friends, family, and even you, anonymous reader. Your support has given me the strength to get this far. I thank you with every fiber of my being. One of the things we were told before surgery was that you can never underestimate the need for a powerful support system. I have that in spades. 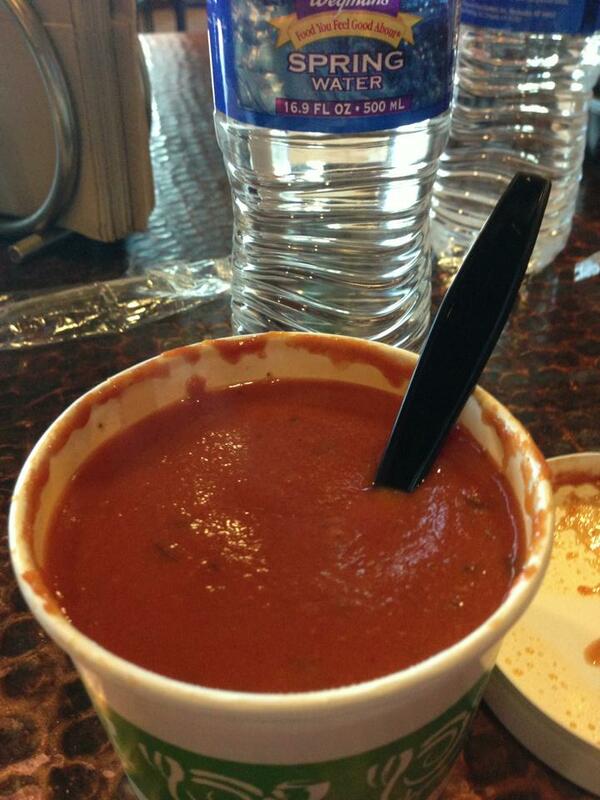 Onto the next challenge… keeping the beetus in remission. 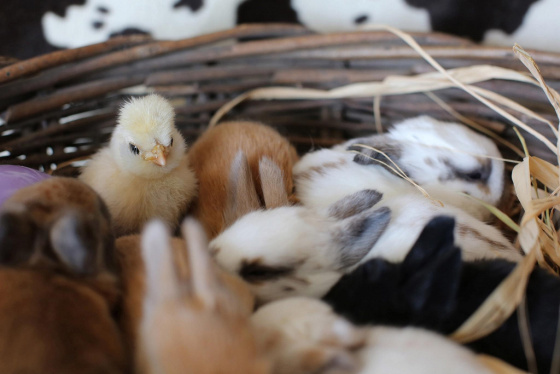 I’ll even throw in a cute picture of baby bunnies and a chick. Literally. So, yesterday was a good day. Still no progress on the pressing issue, but maybe if I stop obsessing about it things might just move along. My mom and sister stopped by. They were suitably impressed by how well my incisions are healing up. They think I look healthy. I actually even managed my recommended fluid intake yesterday. I managed to down two liters of water. That was the first time since the procedure I accomplished it. It took all day, but that’s too be expected. Small sips on a regular basis. I also attempted pudding, and that went down well, and tasted pretty good to boot. Not only that, my sugars came in at 101 (even though I’m off the meds, I need to stick once a day to make sure things are staying where they are supposed to be). The coup de grace was that I managed to sleep flat in bed and scored over 7 hours of solid zzzzz. One other thing I accomplished was to take a walk last evening. I was bored and thought maybe I’ll walk to the end of the block. When I got there, I decided to keep on going and got in a half mile. It wasn’t very fast, but it was the most I’ve walked since the middle of last week. It felt pretty good, actually. I still need to be careful due to the reduced amount of intake, but I’m going to try to do it again. I chose to take the uphill portion first, rather than later in the walk, just to make sure I’d be OK. And yes, I tool my phone with me. That’s always a good habit to get into. I always have my phone with me while I’m walking. Not only does it provide music, it’s a good thing for security. If you fall or are otherwise injured, you can contact someone readily, or if you see suspicious activity. It’s also useful if you go walking in natural areas and see something photo-worthy. After doing a night on third shift, my first stop was the Rec. 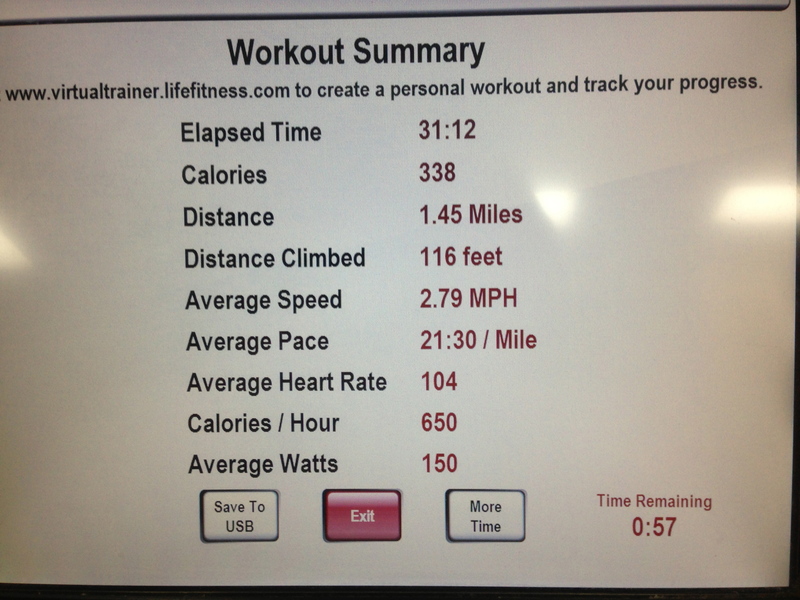 Did a smidge over 30 minutes of cardio, which is 10 more minute than I did yesterday. Maybe tomorrow will be 10 more minutes. We shall see. Wasn’t my best distance or time, but I still need to take care of Wayne while getting my work in. If I don’t, then bad things happen and I get even fatter. I don’t want to be that guy. The hardest part of the shift change is going to be establishing a time when I should go to the gym. Ideally I should go before my shift, get the endorphins going and that will make surviving third shift that much easier. The downside is sleep, or lack thereof. I often joke about plenty of time to sleep when you’re dead, but I’ve grown to appreciate some quality shuteye. I also thought I forgot my insulin kit last night. As much as I am looking forward to never needing to use it again, it still keeps my going for right now. Turns out I left it in the gym bag. Another stellar recall achievement by me! At any rate, I need to grab some of that shuteye I was talking about. As many of you know, Evil Wayne (not to be confused with Vegan Wayne) has caused me some problems of late. Namely a giant blister that left me short a toenail and a good part of toe. I’m pleased to report that as of 6:00 tonight, Wayne is actually looking pretty good, all things considered. Looks like the wound is scabbing over nicely. This is a good thing that I’m attributing to my much better controlled glucose levels. It took me a lot to understand what was involved in getting the sugar under control. See, I’m a huge carb junkie. I love carbs and would scarf unbelievable amounts of pasta and bread, not to mention snack foods. That’s a big no-no if you’re battling The Beetus. I didn’t understand that at first, figuring I was OK because something didn’t have much actual sugar in it. Well, maybe not, but the 40g of carbs are an issue. It makes a huge difference. Have I eliminated carbs? No, but I’m eating a lot less of them. It really came to my mind again today when I was told by a friend that she had been diagnosed with Type-2 (that’s the type I have). 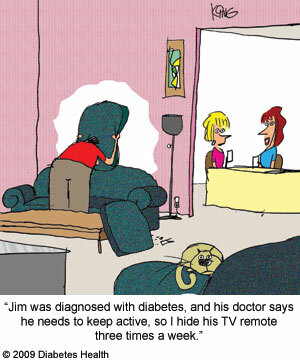 I hope that she will use me as a resource, since I’m a pretty good example of what not to do when you’re diabetic. Or, I was. I’m just so excited that the toe is getting better pretty quickly so I can get back to the gym at full speed. I’m just going to make sure that I protect the toe with a moleskin wrap. Blisters just slow me down. Plus, the surgery date is three weeks away. How’d that happen? I’m still really excited and freaked out at the same time. I think it’s fear of the unknown that get’s me freaked out. I actually don’t mind the anesthesia… it puts me out pretty good and I usually don’t have much memory of what’s going on. This will mark my third time going under general anesthesia, so I’m getting kind of used to it. The part that’s really freaking me out is the possibility of a catheter. I’m just not thrilled with the idea of getting some tube run up through my junk. Of course, talking to some post-op patients at the clinic, not all of them had a cath done. I’m hoping I’m one of the lucky ones. I guess we’ll know in a few short weeks. So, we’re supposed to get a boatload of snow here in the northeast. If you’re in the area, please be careful when driving and especially while shoveling. The next post will be #200. Guess I need to come up with something awesome. Wish me luck!